Magali Roques studied Philosophy, Classics and Language Sciences (B.A.) at L’Université Paris-Sorbonne. She specialized in Logic, History and Philosophy of Science (M.A.) at L’Université Paris-Sorbonne before becoming a doctoral fellow in medieval philosophy at the Centre d’Etudes Supérieures de la Renaissance in Tours. She received her doctorate in December 2012 with the dissertation “Substance, Continuity and Discretion According to Ockham”. Her first post-doctoral fellowship at the Chaire de Recherche du Canada en Théorie de la Connaissance in Montréal was dedicated to William of Ockham’s metaphysics. 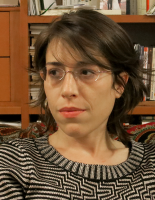 Magali Roques’ research in medieval philosophy looks at the late medieval tradition of nominalism, and more especially at Ockham and his opponents or followers from the fourteenth century (Chatton, Wodeham, Buridan). The aim of this research is to uncover the metaphysical bases of the core concepts of physics (space, time, motion, quantity and causation) and the core concepts of the philosophy of mind (intentionality, consciousness, perception, mental states), with a special attention to the nature of arguments advanced by late medieval nominalist philosophers to defend their views (economy arguments, indispensability arguments, thought experiments). This investigation is intended to question and enrich the historiographical idea of “nominalism”, often limited to characteristic positions in the philosophy of language. At Topoi, Magali Roques carries out her research as DRS-COFUND Research Fellow. She is writing a book on Ockham’s position on space, place and quantity in research group (D-4) Immaterial Causes and Physical Space and is also working on a joint project on the medieval conceptions of cognitive habits and consequently taking part in the activities of research group D-4.